Shaping visitor experiences to maximise money spent. Driving in-store sales through smartphone notifications. Justifying premium mall rents with hard traffic data and lowering operating costs. These are just a few of the potential benefits of making shopping malls smart. Retailers started beaming promotions straight to shopper smart phones some time ago, but until recently that has been limited to the area within and immediately surrounding a single store. With new technologies coming of age, malls have been able to enter the fray with affordable mall-wide data networks that retailers can subscribe to for promotions pushed to smart phones through a permission-based mall app. Malls that offer such apps have seen rapid consumer adoption, because shoppers can be alerted to in-store discounts, coupons and flash offers that they would otherwise miss. Apps can also provide interactive mall maps and even suggest best routes for any combination of stops. The Qwartz shopping mall in Villeneuve-la-Garenne north of Paris, for example, gives shoppers smart phone access to digital product information, price comparisons and a search engine for all products sold in the mall. The Qwartz app also provides personalised loyalty programs and wayfinding. As Julie walks through the mall’s front entrance, the mall app on her smart phone launches automatically. The shopping list she has created shows the retailers that can fulfil it and any offers they have on. She chooses the shoe retailer that’s having a 25% off sale and her favourite summer wear shop. As she is following the highly efficient route that the app has provided for her, she gets a notification from her favourite food court restaurant: ‘Pad Thai combo 50% off until 12:30’ and she stops for lunch. At the washroom afterwards, she is pleased to find that the toilets are impeccable, the counters freshly wiped and the towel dispensers are well provisioned. Another alert comes in and she makes a quick detour to pick up children’s winter mitts at a 55% off flash sale. At the end of her trip, Julie is already looking forward to her next mall visit. Promotion, shopping and wayfinding are just part of the story when it comes to smart malls. Data dissemination is matched with comprehensive data collection, which means that shopper movements can be tracked, revealing recurring patterns that mall teams can take advantage of. Sensors can locate equipment, let maintenance staff know when supplies require replenishing, or help direct shipments to retailers faster and more accurately. The benefits that smart malls can confer are impressive: more loyal shoppers, lower operational costs, and higher mall revenues. The cost of all this? The average smart mall retrofit pays for itself in months rather than years. The technology in question is wide area mesh, or simply ‘mesh’. It’s a wireless network architecture that smart malls can leverage to transfer data of all kinds. Messages can be broadcasted to devices, and data gathered from tags and sensors of every description is automatically collected. The problem is that smart mall implementations are expensive. Solving the affordability puzzle has a lot to do with a huge advance in signal transmission technology. Wirepas’ proprietary beacon signal uses about 400 times less energy than competing mesh technologies, enabling battery-powered beacons to function for years without maintenance. But the special network protocol rides on the 2,4GHz hardware layer as does Bluetooth, which means that any Bluetooth-enabled smart phone or tablet can receive messages from the mesh network. Then back end system powering the phone app can automatically react to any choices made on shopper devices. The frequency, type and configuration of notifications is limited only by the imagination of the mall marketing team; frequent in-mall notifications can be twinned with daily or weekly out-of-mall notifications that alert people about sales events wherever they are. Retailers can push out their promotions and display advertising for a fee, or as part of a lease package. Mall app wayfinding features are a great way to navigate malls, especially for those who don’t go there often or are on a tight timeline. They show shoppers where they are in the mall, and can generate a shopping route based on what they want to buy. The app can be configured, for example, to allow a shopper to pick retailers who have sales on the items on her list. In an emergency situation, they can also indicate the closest exit. How long does it take you to locate cleaning carts, maintenance equipment, fire extinguishers and the delivery carts used to deliver shipments to retailers? Do retailer deliveries ever get misdirected? With mesh, keeping tabs on all assets is a snap. Embedded tags can send signals that show where all assets are within five square meters, regardless of asset density. A single asset can be located on a map with a search for their assigned ID and a LED light on a tag can be turned on remotely to signal which asset to use. Sensors can be used to measure and finely control temperature, air quality, humidity, ambient light, surface cleanliness and other environmental factors. HVAC, lighting and other systems can be configured to react automatically to sensor data. As natural light dims, for instance, electric lighting can brighten automatically. Sensors can alert staff to things like the need for towel replenishment in washrooms, or liquid spilled on the floor. Studies show that neat washrooms, as well as optimal ambient light, temperature and humidity, have a positive effect on length of mall visit. Mall visits can be measured in terms of length, but also in terms of location. 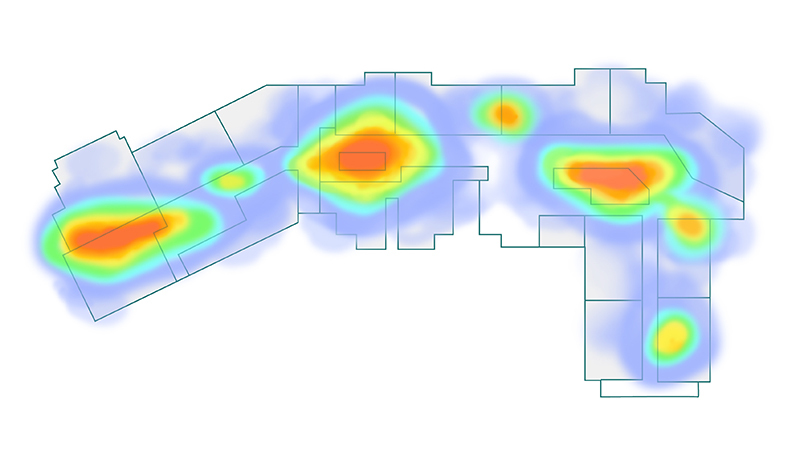 Mall teams can track shopper movement over hours, days or months with interactive heat map display. These use colour coding to reveal high traffic areas (red), low traffic areas (blue) and movement patterns over the course of the day. Heat mapping is a powerful sales tool. It can justify higher rents or help sell a retailer on a particular location by proving beyond the shadow of a doubt how much traffic that location sees, and when. It also helps teams to prepare for the kind of movement they see on Mondays, as opposed to Saturdays, and know approximately how traffic will change over the course of each day. This can help mall teams to better place kiosks, prepare maintenance staff for food court rushes, allocate more mall helpers or security staff, and more. Heat maps used in stores can of course be used for focused in-store campaigns. There are two parts to securing a mall: mitigating actions like theft; and preparing for fires and other security events. Sensors can help with both. Apps can alert shoppers to security events and automatically show the shortest route to safety or to the nearest exit. Sensors can detect smoke and also provide messaging that everything is okay, for instance if an alarm goes off or there is unknown smoke but no actual fire. In the case of theft, sensors can be used to geofence mall assets, setting off an alert when they exit a prescribed area. Mesh technology provides a base technology that offers a plethora of use cases. It enables advertising, messaging and wayfinding. It provides the network required for the anchor and asset tags needed to track assets, and for environmental, lighting and acceleration sensors that help moderate the environment. There are many other possible applications, like emergency preparedness alert systems, security alert systems and network-connected cameras. The applications that generate the most revenue right away involve shopper interaction, but sensors can help stimulate spending in many small ways. If you can make the mall a more comfortable, safe and exciting place to be, shoppers will stay longer and buy more. Is mesh the advantage that malls have been looking for to boost sales and attract top retailers? It’s too early to tell, but even something as basic as heat map traffic data and robust promotional messaging could go a long way towards keeping A-list retailers and delivering handsome rents.